A sign on the service department door tells customers of the change. Downtown Albany used to have several car dealerships, but in recent decades only one was left. And unless somebody starts a new one, the era of downtown automobile stores in Albany now is gone. 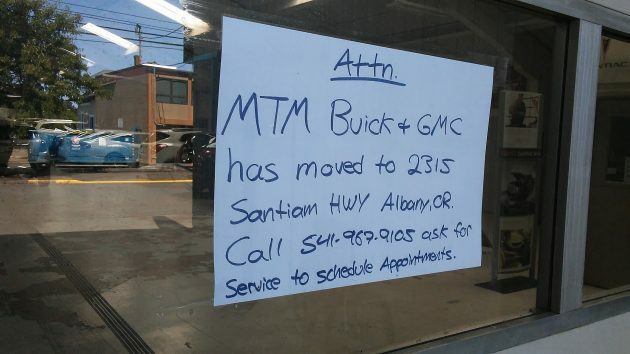 Mark Thomas Motors Buick and GMC, at 505 Ellsworth Street, has closed up and moved to the other MTM store on Santiam Highway. The downtown property is for sale, with an asking price of $1,990,000, according to the listing with Brian Oare and Associates. I don’t know the reason for this change in the downtown business scene. When all the new vehicles had disappeared from the lot recently, I assumed at first they’d been moved to a sales event at the Expo Center or some place. And then I paid no further attention. Saturday I took a closer look but wasn’t able to reach anyone. 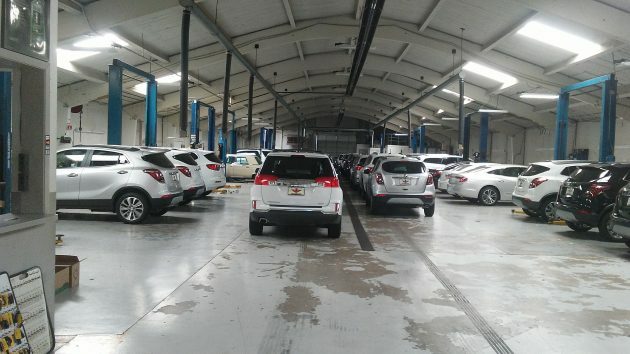 Some of the inventory was stored inside the service department, presumably waiting to be moved or sold elsewhere. The property comprises the whole city block, measuring 1.36 acres, between Ellsworth and Lyon streets and Fifth and Sixth avenues. For many years I worked across the street in the newsroom of the Democrat-Herald. Often, walking to or from the office, I would entertain myself by admiring the trucks and cars on the lot and, especially, in the showroom window facing Ellsworth. For several weeks in the winter of 2007 I admired a blue-gray truck in that window. It was a basic GMC Sierra with a standard cab, but with a powerful V-8 and a smooth transmission. I kept looking at it through the glass, until one Saturday morning I walked in and bought the thing. It turned out to be a great truck, and I loved it more than any other rig I’ve had in nearly 60 years of driving. The truck got great care at the service department off Fifth Avenue, even after on one visit, the service technician checking under the hood reported the evidence of mice. Their window sign is a bit misleading. 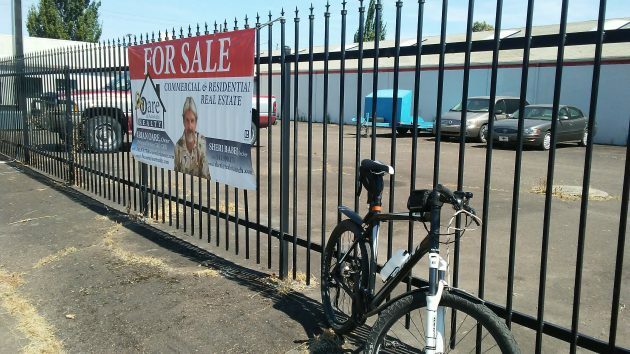 I see no evidence of them selling new Buick/GMC vehicles at their Santiam location other than the occasional used. Seems to me they or General Motors gave up. One could say quit. Along with Hyundai. The real concern is fewer new brands to choose from in Albany. HH, I appreciate your telling of American muscle in form of a truck story. Very convenient for you to have a maintenance shop right next to your work those years. Granted you spent $$$ in upkeep. The handiness sure made it easy though! My wife Tami and are also sad to see this place go. It was our preferred location for oil changes and other service. However, I expect the lot is too small for new vehicle sales today, and as MTM already has other property, perhaps it just made financial sense to close this location down. You probsbly Recall the Ford dealership downtown I miss walking down second street watching the automotive hustle to get cars-trucks out from sales and in for service snd body work. My understanding is that GMC rescinded MTM’s liscense and gave it to Thompson from Portland. GM seems to be very active in killing off the smaller mom and pop dealers.